Please donate: Peckham Vision is a local group that works to keep local people informed of changes in our community, and how they can take action where needed. We rely on voluntary contributions; please make a donation so we can continue this important work. To make a donation please click here. Peckham Vision 2019 volunteering opportunities: enquiries welcomed. CLICK ON LINK TO THE LEFT. Please click here for Peckham Vision CURRENT VOLUNTEERING OPPORTUNITIES: enquiries welcomed. from 13th February drop-in each Wednesday 6.15-7.15pm see building and exhibition, and give your views. Wed 20th March 6pm exhibtion, 7-9pm Public meeting. Local Heritage. Speakers & discussion. Peckham Vision written statement on importance of collaboration with the organised community sector. Peckham Vision written statement - Peckham Vision work in Central Rye Lane as case study of regeneration without demolition and redevelopment. 'THINGS DON'T JUST HAPPEN': there is hard work in community action behind the scenes of successful campaigns:Time Out article. Peckham Vision CURRENT VOLUNTEERING OPPORTUNITIES: enquiries welcomed. Peckham Multi Storey future **Success! pioneers ways of connecting local people who want to contribute, including Peckham Town Centre Forum. From the archives: alternative vision. the Tube map shows just TfL services, and none of the other several direct connections with the Tube. Network Rail's maps don’t give a clear picture about Peckham’s Tube connections. 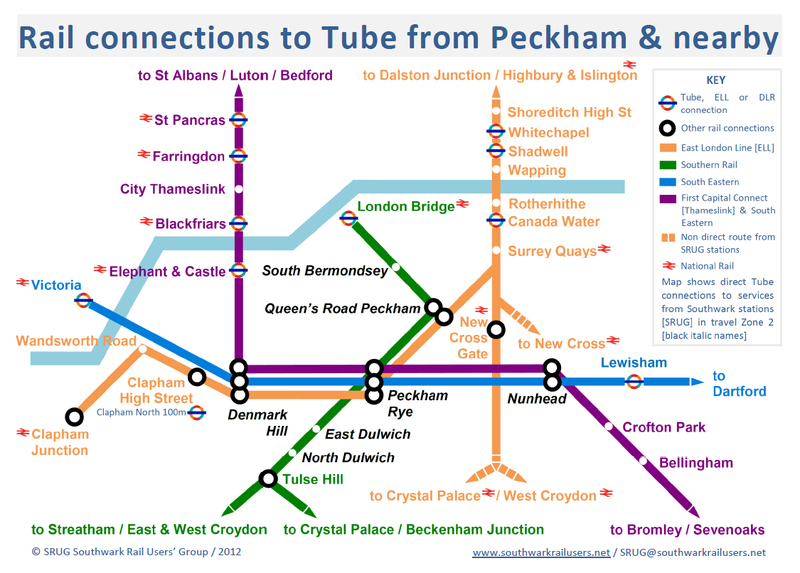 So we produced a map (posted to the right here) showing Peckham's direct connections to the Tube, and to central London. It shows how they link with TfL's underground (Tube) and overground services. Here is the FULL EVENT on video. community story of the restoration of the Old Waiting Room. PV Central Rye Lane Walk 2-4pm, start in PV Bussey studio. Book here. 9th June 2018 PV stall at Peckham Levels Open Studios. PLANNING POLICIES to 2035/40 - community arranged drop-in advice events for making comments are being held on 8th, 15th, 17th, 25th, 29th, 30th January, and 5th February. More information here. Wed 14th June 2017 6.15-8.30pm Talk on the Old Waiting Room restoration. 6th May - THANK YOU to 5,200+ people who wrote to the Council on the future of the Peckham Multi Storey. More news soon. Up to 5pm 28th April Council consultation on New Southwark Plan (NSP). DETAILS HERE. Comment on NSP proposal to demolish cinema & multi storey car park. LETTER HERE. Further info here. Thursday 12th January 2017 4-8pm drop-in Barry's Café beside station for Council's news on station square redevelopment. Support the small Peckham Vision team: please complete our SURVEY by 20 November 2016. Further info click here. Click to see the Council survey of 'co-design' with Station Sq & Library Sq developments Survey closed. Report awaited. Tues 19th July drop-in 3-8pm.Launch of Peckham Town Centre Cleanup! This page was last modified 16:03, 22 March 2019. This page has been accessed 942,678 times.